I've got to say that Nokia's Sport Tracker application running on the GPS-enabled Nokia N82 phone is pretty slick. It doesn't get any easier than this! Naturally this requires you to have a data plan with your cellular provider. I'm taking advantage of Rogers' offer of 6 GB for $30/month. The new Terminal 3 at Beijing International airport is now by itself the largest airport in Asia, as well as the newest. After registering with the Immigration authorities -- who you are invited to grade on their customer service! -- you are quickly whisked to Terminal 1 in an automated train that takes only a few minutes (compared to up 45 minutes of hell for the same process at London's Heathrow airport). You may see a few, or more likely, a lot, of these fellows if you are arriving during the Olympics. Speaking of the Olympics, traditionally, synchronized swimming is a women-only event at the Olympics. 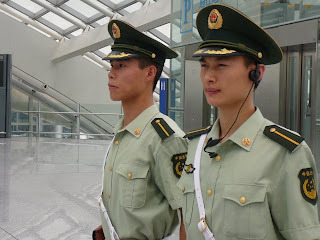 But the Beijing airport police have a strong contender for a new event - synchronized walking. Once through Customs, you are free to head off on your way to Beijing. 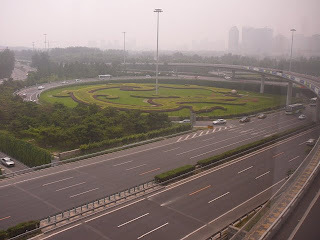 I was lucky to be met by the office manager of my employer's Beijing office, and took a taxi to town, but otherwise you can just walk over to the Airport Express train station, location on the roof of the parking garage (which itself has a field of crops growing on its roof). By the way, this picture was taken on a sunny day from my departing aircraft - that's smog, not fog, in the background. The train station is the silver teardrop in the centre of the circular parking garage. The train runs on an elevated track all the way to the city, paralleling the airport expressway. In the photo at left you're getting your first glimpses of the city through the smog: lots of apartment buildings and some stylish garden work in the cloverleafs. 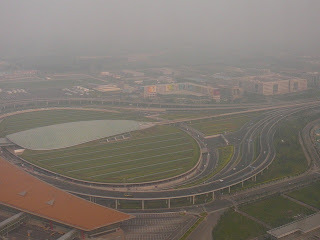 (That's the 4th Ring Road in the background). 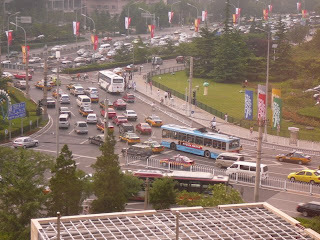 After I got in to town, I checked in at my hotel, got my room, and gazed upon the bridge where Dongsishitiao Road (E-W) crosses over the 2nd Ring Road (N-S). Pedestrians, bicyles, tricycles, scooter, cars, trucks and buses all seem to negotiate this roundabout without apparent anguish. Friday rush-hour traffic. Next morning, I took another look. The traffic was quieter, but the air quality no better: that apartment building disappearing in the smog up the 2nd Ring Road is less than 1 km away. After an over-priced breakfast in my hotel, I stepped out the door and into the subway. Gulp - my first solo adventure in a country where I don't speak more than 3 words of the language. I confess I felt a little appre-hensive. At the ticket counter, I realised I didn't know how to say "Do you have any all-day tickets? ", or even "I'll have one ticket, please", or even "one", or "please". All I could do was hold up one finger, to which the agent replied by holding up 2 fingers. Right, I need to pay him 2 Ren Min Bi (about $0.30). I got on the No. 2 line (dark blue) northbound, then transferred to the No. 13 line (yellow) northbound. After one more stop, I got out and started walking. My destination: a Dahon folding-bike store. Lucky for me, I found the store without too much difficulty. And even luckier, they could speak a few words of English. Pretty soon, we had most of their stock out on the sidewalk. I felt like Goldilocks trying one that was too big, another one (the pink one) that was too small, then a final one (silver, behind the red one) that was just right. The price: $200. It's a Prestolite with 16" wheels (more portable than the 20" model I already own). At a local clothing market I found a good carry-bag for it for about $15. I was all set to go exploring! 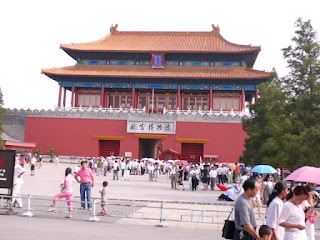 After a couple of hours of aimless wandering around, just enjoying the new sights, sounds, smells and sensations, I found myself at the north gate of the Forbidden City. It didn't look like I could take my bike inside, so I rode around to the east gate and walked in there with it. Because the folding bike is so small (and probably because I'm a foreigner) I got away with this. I followed the crowd and eventually emerged out the south door of Forbidden City and then the south door of Chairman Mao's tomb. Here I wanted to take a picture of the portrait of the great leader but a policeman told me to "keep walking" and "no pictures". 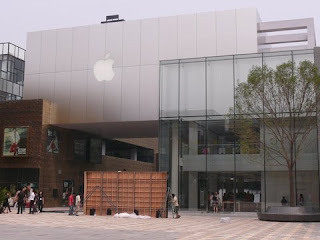 Finally, 100m down the sidewalk, I was able to turn around and take a picture of the building. 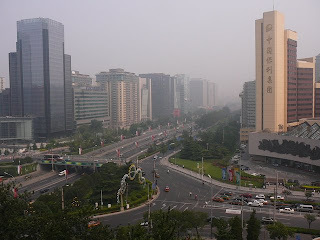 Next, it was time to investigate the very large open space across the road: Tian An Men Square. At the exit of the underground passageway that crosses the busy thoroughfare, from Mao's Tomb to the square, police officers wouldn't let me take my bike into the square. But after I folded it and stowed it in its bag, I was able to walk right in. The square indeed does seem like it truly is the world's largest public square. 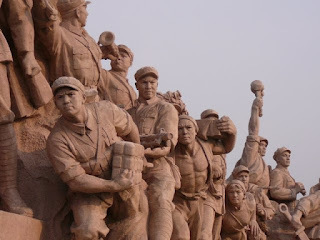 I made my way to a famous local statue, the monument to the people's heroes. A local resident gestured that he wanted to have his photo taken with me in front of this statue. Individuals are always welcoming; governments less so. 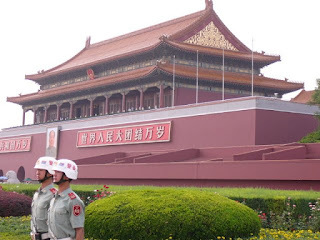 The Chinese government in particular doesn't want its citizens to remember the massacre of June 4th, 1989 in this very square, but I felt the history like a weight on my shoulders as I slowly crossed the enormous space. Time for some retail therapy! 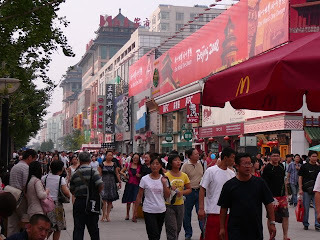 I rode over to Wangfujing Street, supposedly the shopping street of Beijing. It was jammed with shoppers, or at least pedestrians, as it's a car-free mall for a couple of blocks. It was bike-free, too, so I rode around the block to the far end, then continued on north. 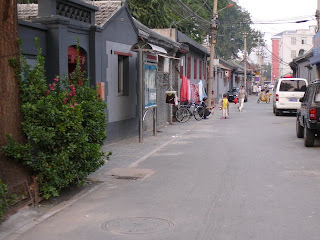 I went looking for the Lama Temple, and crossed through a neighbourhood of narrow streets, called Hutongs in Mandarin (not to be confused with the Cantonese that people from Hong Kong speak). 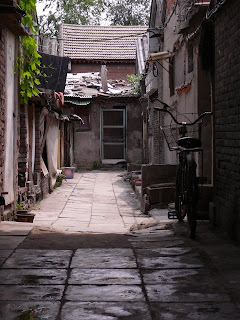 Apparently much of Chinese traditional life takes place in the residences that line these hutongs or the side-alleys. I had vivid memories of this topography from the night that I watched the movie 'Beijing Bicycle' while in Rio de Janeiro Brazil. You can watch a trailer for the movie below. 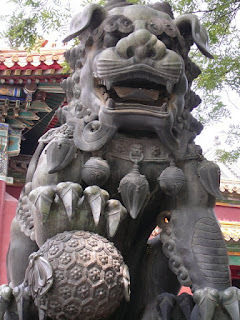 The Lama Temple was closed unfortunately, so I returned home and planned to try again the next day. Sunday: one more day before I change from tourist to business person. 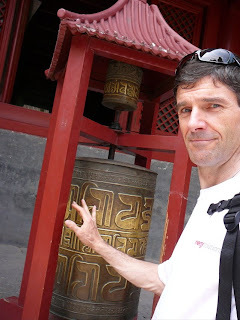 I got up early and rode up to the Lama Temple, or Yonghegong, and paid the modest fee to enter. I was greatly honoured to be able to spend a couple of hours contemplating the buildings, originally a royal palace but turned into a Buddhist lamasery in 1744. 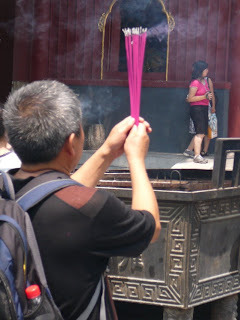 I was somewhat surprised at how many Chinese-looking people seemed to be paying devotional respects by burning incense and kneeling (always three times). Inside the buildings were a variety of religious statues, including in the largest building an 26m-tall Maitreya Buddha statue carved from a single block of rosewood (and thus, the plaque says, holder of a Guinness Record). The pictures below don't begin to capture all of the rich visual tapestry of colours and forms that inhabit this place. 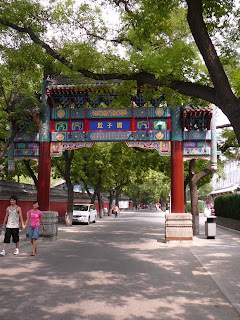 Near the Lama Temple by chance I came across the Guozijiang Hutong, which apparently is Beijing's only ancient-architecture street, dating back at least 500 years. 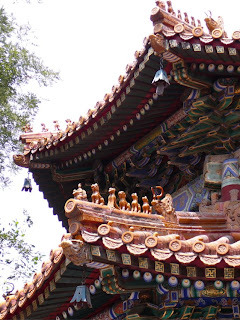 I found a temple to Confucius which I didn't have time to visit, and the Xu Xiang Zhai vegeterian restaurant -- Beijing's first -- where I returned to dine that evening. 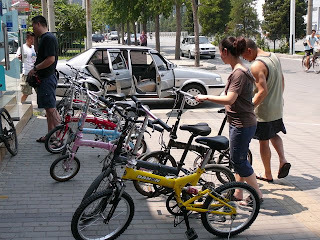 During my work-week in Beijing, I continued to ride my bike, commuting with a few of the millions doing the same. 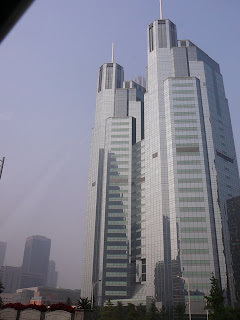 I got a chance to appreciate some of the impressive office buildings that have gone up in recent years -- a testament to the vast inflows of capital to the country. Many of these buildings display an innovative and intriguing architectural style, leading to embarrassment over the beige rectangular boxes that pass for design in downtown Calgary. 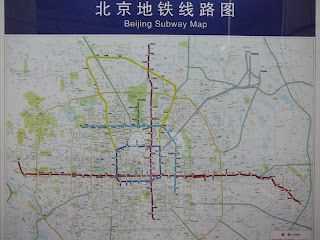 So, what's it like to travel around Beijing by bicycle? Fairly relaxing, actually. Most of the major roads have separate bike-only frontage lanes, while the lesser roads have painted bike lanes -- though these can be a bit tricky when buses decide to pull into and stop. In addition you have to cope with some cyclists travelling the wrong way (probably to avoid having to cross the road for just a block or two). At the intersections, things get a little trickier yet, but the best advice seems to be: ride as slowly as the locals, because you have time to adjust to everything that's coming at you. If you try to ride as fast as most North Americans do, you'll find that problems crop up much more quickly -- as can be seen in the video below. One night while riding near the Buy Now Hui electronics market I heard music coming from a parking lot and stopped to investigate. A number of elderly women were performing a traditional dance, while several musicians provided appropriate music for the dancers. Young people passed by without paying any attention (in many cases talking on cell phones) but I was fascinating and stayed quite a while. If I hadn't been riding a bike, I would have missed this cultural moment. The remainder of my week was spent working in the nearby Langfang City, just a baby of 3-4 Million, and where the air quality wasn't any better. 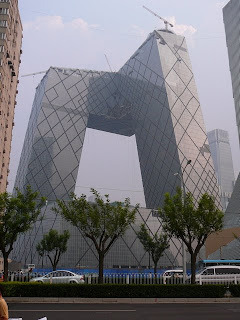 If you haven't been to Beijing, give it a thought. It truly is a world-class city and has lots to offer the tourist. Spring or fall might be best though, as it can get very hot during the summer, and quite cold during the winter. Below's a map showing some of the locations mentioned in this post (click on the placemarks to see a description). 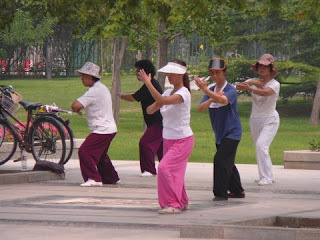 And if you want to see more pictures from my Beijing trip, check out my Beijing album on Picasa. Addendum: a couple of weeks after my rides through Beijing, US Cycling team member Jason McCartney went for a ride through Beijing. The NY Times has a story and nice slide show with audio. uploading tracklogs ('syncing' in Garmin-speak) was easy and painless using the provided USB cable and dock. You can use the provided GTC, Garmin Training Centre (more on that later), or else use any number of 3rd-party apps like SportTrack, G7ToWin, GPSDump, and others. The 3rd-party apps will also export the tracklog as a tracklog, while the Garmin adopts a logbook paradigm instead. receiver sensitivity is not as good as I hoped for. Since the SirfStar III chipset is used, I expected good sensitivity. Instead, the GPS briefly lost its fix 4 times during a 20 minute run along the Bow River in Calgary; I ran on a pathway shaded by poplar trees. When I uploaded my trip, the Garmin GTC software said I'd complete five "laps". Like hell I did! Speaking of GTC, it maintains a database of activities by date, and further splits out your activities by type: running, biking, or 'other', which could include anything from hang gliding and paragliding to riding a motorbike, skiing, etc. When you start your activity, you tell the GPS what type of activity you are undertaking. Otherwise it will go into the 'other' category. The GTC does not understand or know about tracklogs. The Forerunner 205 can record 3.5 hours of activity at 1 point per second. If your activity is longer than that, you need to put it into "Smart recording" mode. No information is provided on what this means or how long you can expect to record. Further, you can't set the GPS so it will stop recording when its memory is full. Instead, it will begin over-writing earlier activities. Not good for record record flight attempts! You are quite limited in the data fields you can display. Yes, you can display speed, altitude, heading, but not rate of climb or descent, or even distance to next turnpoint. You can create waypoints and then create routes that use these waypoints, but there's no simple Go To button or feature. You can't use the GPS as a watch because you cannot select the current time for display. A small clock appears in some Settings displays, but it doesn't show the seconds, only the hours and minutes. There is a start/stop button and a lap button, enabling you to record just the parts of your activity that you are interested in. Each time you lose satellite coverage, you also create a new lap. If that's not what you wanted, then you can export the data in a .gpx tracklog format, open the file with a text editor, and stitch together the segments by removing pairs. The wrap-around body is designed to ensure that the GPS antenna always faces the sky. This works well for running, but the angle may not be right for biking with a flat-bar bike. For flying, it would be okay for paragliding, but likely poor for hang gliding. However, the Forerunner probably does better at biking than the Edge model does at running! When you start up the GPS, it will likely take at least a minute to get its initial 2D Fix, and another minute to go to 3D (with altitude). During this time you should not walk or move at all, otherwise you will have to wait longer, or have an incorrect altitude in your tracklog. The GPS comes with 2 lengths of wrist-strap, so virtually all wrist sizes can be accommodated. Conclusion: an acceptable running GPS, but has poor performance under tree canopy. Not as good for biking, and poor for use while flying. Maybe this has been kicked around already, but I'm late to the party, or inattentive. 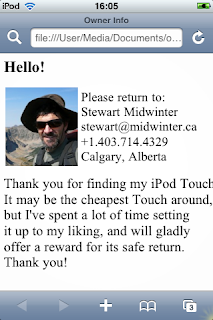 Then too, I didn't actually own an iPod Touch until last week (it arrived the very day Apple released the SDK), so I'm only finding out some of this stuff now. I'm all about handheld functionality, having been a PDA user since 1992 (Sharp PC-3100) and a Palm user since 1996 (I bought one instead of a Newton because it was way cheaper). In recent years I went through a collection of Palm devices ending in the TX, but gave up on Palm when it became clear the company and the platform are moribund. I have a Windows Mobile device at work, but the user interface is so awkward it hurts me to use it; and then there's ActiveStync, the most off-putting utility you could ever want to use. So, I've been looking with interest (from afar) for the past year at the Apple iPhone, which has shown great promise since its introduction. Since I'm in Canada, I don't have access to it (except by buying one in the US and unlocking it, which leaves me at risk with each new update). Recently I learned that Rogers won't be selling them until at least the rumoured 3G iPhone is released later this year, so I broke down and bought a refurbished 8G Touch from Apple's store. I was surprised and pleased to learn that it had the latest software update (1.1.4) and new apps (e.g. Calendar) even though the store listing said "original software" instead of "new version software". After a few days with the unit, I have some comments about it as a PDA. jailbreaking is easier than ever. Just go to ziphone.org and download an app, run it (after shutting down iTunes and iTunes Helper) and in about 3 minutes you'll have Installer.app on your Touch (or iPhone) and be able to load on 3rd-party apps. Or you could wait for Apple's 2.0 software to be released in June, I guess. Note: jailbreaking is the not the same as unlocking: the latter only applies to iPhones and is intended to allow you to use a cellular provider than AT&T, while the former merely allows you to add functionality to your device. First off, while I have 8GB for music, videos, podcasts, by default you only have 300 MB for applications. And of that, much is taken up already by the operating system. I found that after loading on only a few apps, I got a "low disk space warning" when I tried to install the Python programming language. The solution is to make your first install the handy BossUtil app, which allows you to move stuff from the apps partition to the media partition (while also creating a symbolic link so the operating system doesn't notice they've moved). I moved my fonts (the recommended first choice) and that immediately freed up 100 MB! I then immediately synced my Touch so there'd be a backup of those fonts on my Mac. More on this backing up in a bit. I won't talk much about Safari except to say that it is (just like the ads say) the best mobile browser I've ever used. I mean, I've heard that over and over, but it wasn't until I used it for an hour that it sank in just how much better it is than anything else. A big part of that is the multi-touch screen which allows instantaneous, seamless, painless zooming in and out. Oh and, multiple tabs. One hint: if you are using Safari on your desktop you can go into your preferences and turn on bookmark sharing; it's also a feature in .Mac. This greatly simplifies getting your favourite sites onto your Touch/iPhone. Get all your calendar categories set up before you start syncing with the Touch. If you sync once, then change your desktop iCal categories, the Touch will still keep the old calendar names in its database (I went looking into the sqlite calendar database to discover and correct this - not for the faint-hearted) and will get very confused. Some people have resorted to a Reset to get out of this situation, but I didn't want to re-jailbreak and re-install all my apps. Screen orientation. Safari switches automatically between portrait and landscape mode, but many other apps don't (yet?). I would really like to see a landscape view for the calendar so I could see a week at a time. Same thing for Mail. Todos: there are no ToDos on the Touch, except for those provided as part of Mail.app on the desktop. My solution is RememberTheMilk (free on the desktop but a commercial app on the Touch), but of course I need an internet connection to make that work. Kludgey off-line workaround: I installed the TextEdit app which allows me to note things. SSH - I installed the OpenSSH server, and it's sent to run all the time. I can connect to my Touch from my wireless desktop from a Terminal window with "ssh -l " . Check the Settings > Wireless on the Touch to find your IP address when connected via WiFi. (Before I could get SSH going, I had to repair the /etc/termcap file on the Touch in order to have it accept a connection from 'root', password 'alpine'; look for forum posts on this topic). SCP - once the SSH server was installed, I could copy files to/from the device, and thus make a complete backup of all apps and settings, using the SCP (secure copy) functionality in the excellent Fugu app for the Mac. I'm sure there's something similar on Windows. This allows me to treat the Touch effectively as an external drive. BTW, Mac users can also install an AFP server on their Touch and then simply user Finder to browse to the device by using Connect to Server and then specifying "afp://ip-address-of-device" as the connection name. iSpit - I also installed the iSpit micro-webserver on the Touch, which is designed for one purpose only - to share files from your Touch. I just open a web browser and go to http://<ip-address-of-Touch> and then click on links to take me down to the desired folder and the right-click on the desired file and Save As. Maps: not strictly a PIM functionality, but I'm impressed (and maybe a little creeped-out) as to how accurate the aGPS is (geo-location using WiFi information rather than satellites). I don't know how they do it, but at both my office and my residence I've found that GoogleMaps has located me within a two-block radius. Pretty handy to then do a Google search on "pizza" and then find out where I can walk to for dinner! whenever possible, do input in landscape orientation, since each key will be wider. I've found that in Safari this makes a substantial difference to my speed and accuracy. 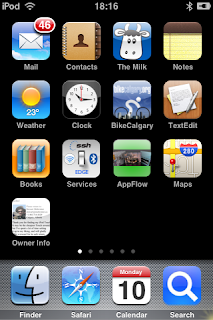 Too bad Mail doesn't run in landscape mode (unless somehow jailbreaking took away that feature). if you make a mistake, you can zoom in to the exact spot where the correction is needed (if it's not at the cursor location) by press-and-hold, which bring up a small magnifying glass; you can then slide your finger to move the cursor to the exact insertion point. turn off auto-complete in the General settings. I found its usage to be confusing and it just kept doing the wrong completion for me. The tool is basically useless at this point. 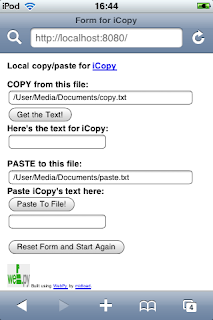 TextPlus on PalmOS or WinMo is way better. and this isn't a keyboard tip exactly, but you should note that the Touch and iPhone have no Cut and Paste capability! WTF were they thinking? This is so basic a need that I'm surprised they haven't fixed it yet. I'm guessing that the 2.0 software will address that. If it doesn't, some resource developer will. Integration with Exchange: the other bombshell at last week's Apple event was the announcement of full Exchange support for the iPhone. That should address all PIM functionality requirements, but at the expense of using ActiveStync. Yes Martha, there will be AS on the iPhone. But not on my device. AS was the reason I left Windows Mobile, and it's easily the worst piece of #$%^& ever created by Microsoft. I can't begin to count the hours wasted on that sorry excuse for a sync tool. They should have licensed Hotsync from Palm, the most reliable PDA sync tool I have used. Oh and Apple developers, please check the discussion forums on your own website - lots of people are having problems syncing their Touches through iTunes. With the release of the SDK beta version, the floodgates have been opened, and soon we'll be seeing a plethora of mobile versions of well-known desktop apps. By the time that Apple's App Store opens in June, there should be hundreds of apps for the device. This is truly a renaissance moment in the mobile world. My only question now is whether Apple will build on the iPhone's and Touch'e success: will a 7" Apple MID be next on the horizon? What? Your iPod Touch doesn't have Bluetooth? Why, that's a shame. Didn't you hear about the new refresh of the model in early January? It was going to be a "Just One More Thing" item in Steve's presentation but it got chopped for lack of time. Anyway, I got mine soon after and was delighted to see it had this new feature. Now I'm using external bluetooth headphones, external keyboard for text input, getting internet by tethering to my Bluetooth-equipped phone, and the best part - external bluetooth GPS for navigation! Well, those would be sure nice features for everyone to have, and we can sure hope that Apple introduces them in the next upgrade. In the meantime, we Touch users can install the Bluetooth app on our jailbroken units and experience a tiny little frisson of excitement every time we see that icon. I am so done with ActiveSync! It's the application that is responsible for keeping a Windows Mobile PDA in sync with a desktop PC, and it is the worst application ever created by Microsoft. This p.o.s. program has cost me more time than any other I have on my computer, in any operating system (whether Windows, Mac OS X or Linux). Its reliability and availability is abysmal. Take a look on any support forum, and you'll find it full of people with endless problems with it. Take a look at this list of possible errors you might experience with ActiveSync. The list has more than 50 entries! Frequent suggestions to users include: "reinstall Microsoft Office", "reinstall Outlook", "delete everything on your PDA", "download a new certificate", "backup your Outlook folder, delete the application and reinstall", "open ports in your firewall", and many other even more obscure suggestions all aiming at getting the thing to do what it is supposed to. And to think that they're up to version 4.5. How many tries will it take to get it right? Meanwhile, in years and years as a Palm user, I never had this type of problem with Hotsync. The damn thing "just worked". Unfortunately for me, I sold my Palm TX recently, and am stuck with a PDA I use at work. But, I do have a plan. From now on, I will no longer use ActiveSync. As an alternative, I'll use the Funambol Google Sync plug-in for Outlook. This will keep my Outlook calendar in sync with my Google Calendar. Then I'll use (and am already) the free GooSync application to keep my Google Calendar in sync with my PDA. If I pay $40/year for the premium service, I can also sync all my contacts, and multiple Google calendars. Thankfully we're moving into an age where more and more applications are available over the internet, so we don't have to tolerate any more the crap that comes out of Microsoft. I am greatly looking forward to the release of the Apple iPhone in Canada so I can once again get a PDA that will "just work" and sync effortlessly to my Mac or my Windows PC.